I grew up eating seven layer salads, made by my mom who would whip them up anytime we had a cookout or party at our house. They're always a hit and make for quite a stunning presentation. But here's the thing I have come to realize: you don't have to have a party, or even be going to a party, to make this salad. 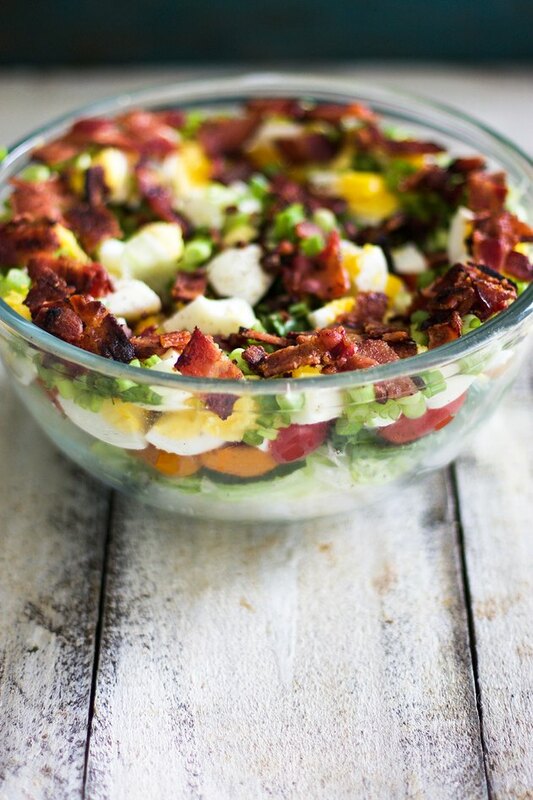 In fact, I think this salad deserves to be at your table any day of the week! The gist of this dish is that it has seven layers. 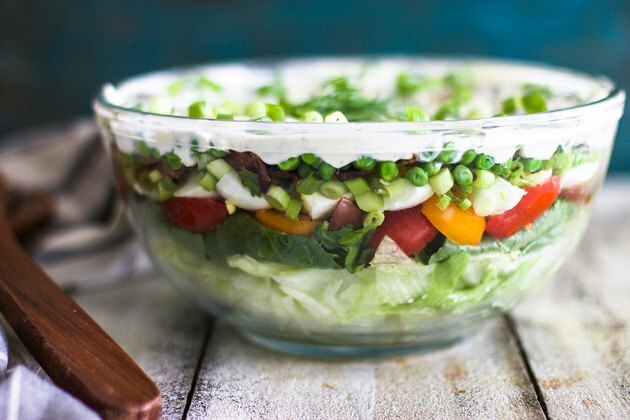 The layers can be switched up to your liking, but peas and boiled eggs in my opinion are the two ingredients that should always be a part of your seven layer salad, otherwise it just wouldn't have the same feeling. You are going to love making this classic, easy recipe for all of your family and friends! Additional toppings can include cheese, corn, cucumber, red onion, or any other vegetables you like. 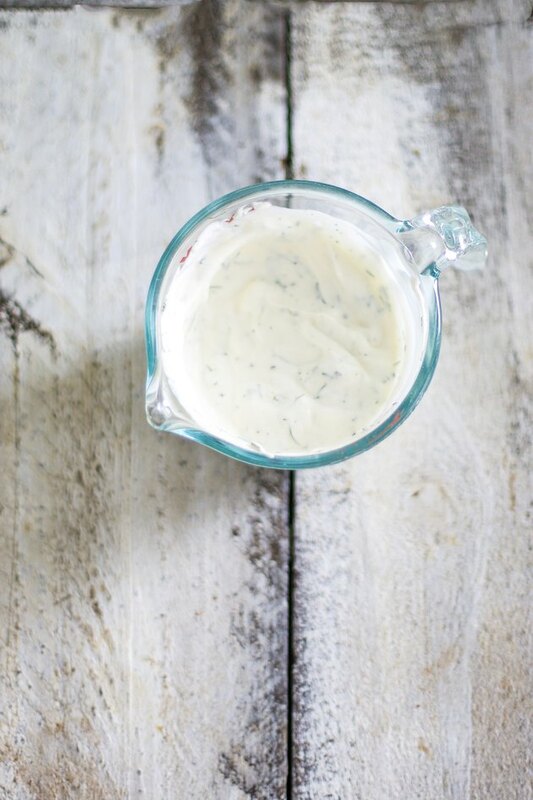 Make the dressing by combining the Greek yogurt, mayo, sugar, salt, pepper, and chopped dill and whisk to combine. Set aside. 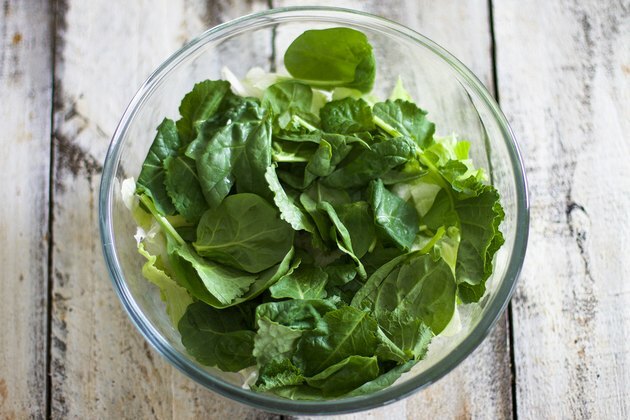 Layer the iceberg lettuce on the bottom of your glass bowl followed by a layer of spinach and kale. Layer tomatoes on top of the lettuce. A tip to keep all of your layers showing on the outside of the bowl is to concentrate them around the edge first and then sprinkle them towards the middle. 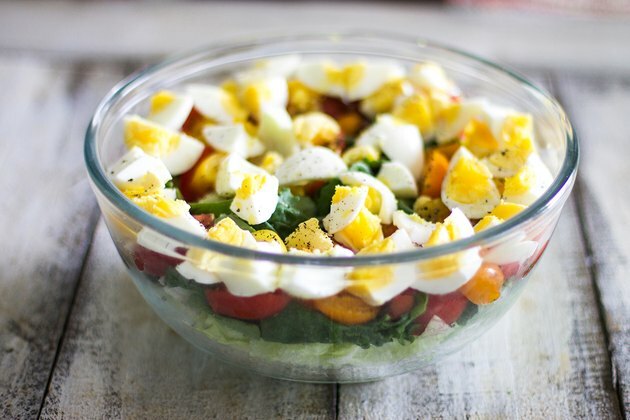 Layer the boiled eggs on top of the tomatoes. Season the eggs with pepper at this point if you want to add extra flavor throughout the salad. Add bacon on top of the eggs. Add frozen peas on top of the bacon. Add the peas frozen, and they will defrost on their own before you serve the salad. 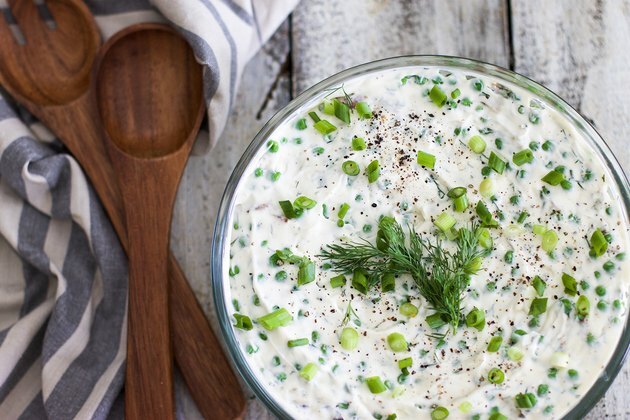 Spread the dressing over the peas using a spatula in one even layer and sprinkle with extra dill and green onions for garnish. Refrigerate the salad until ready to serve. How easy is that? 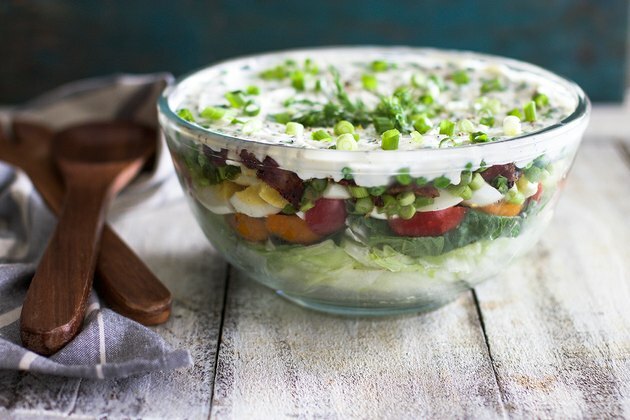 Next time you can't decide what to bring to any get-together, make this seven layer salad and I guarantee it will be a hit! 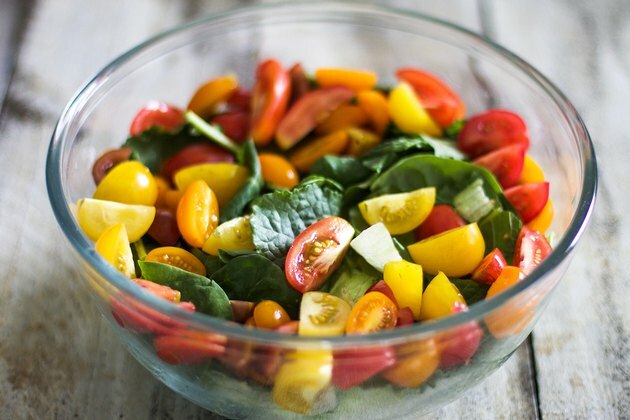 This salad can be prepped up to a day in advance. Once the salad is tossed, it should be served immediately.